Monica Gale Top STAMPIN'UP! UK Demonstrator: FRIDAY the 13!!!!! Eeeks!! Hello there, how are you today and more importantly are you superstitious? I cannot say I am but there were times in my life when certain spooky things have happened that made me go OMGOSH!!!!! Anyway THANK GOD IS FRIDAY thirteen or no thirteen. I am sharing our latest team training event today. 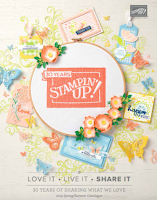 We meet every month for stamping, swapping and sharing and this Tuesday we did just that. Elegant Eggplant, Old Olive and the speciality paper was misted using shimmer paints with reinkers added to it. Our quick workshop suitable make n take was a Christmas card. 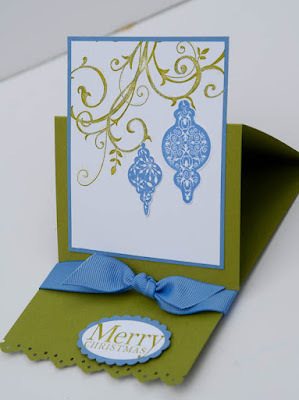 Love easel card and this baby is sparkly all over. Bordering Blue(love this blue) with matching grosgrain ribbon and Old Olive. Stamp sets Baroque Motifs and the fab Tree Trimmings. I like this one simple but so pretty. Our 3 D item was this delightful packaging idea. Love this!!. 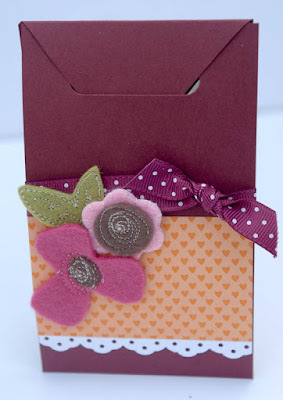 Bravo Burgundy, Pumpkin Pie paper from the Petal Party scrapping kit, sweet pea felt flowers and Razzleberry dotty ribbon!! I have to confess that my eyes and my poor lighting in my room failed me this time, the card was meant to be razzleberry and I didnt noticed I picked the wrong one till after everything was cut out oops. I love this and wait have a look at what's inside. 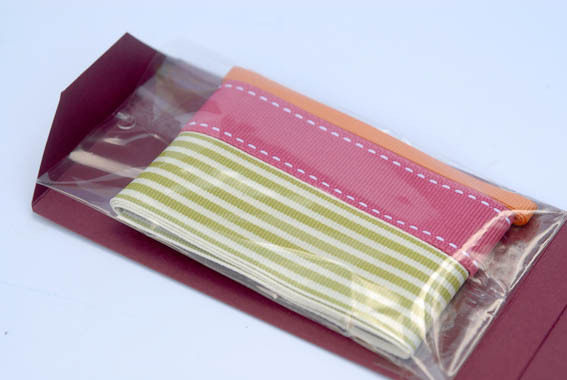 A sampling of pretty ribbon, what a sweet gift idea for a hostess or a crafty friend. Join me tomorrow when I will show you the swaps. Our theme this month was back to school. WOW wait until you see what these demos came up with, you will love all the ideas. How is everything going with you?? I hope youre enjoying your summer. What lovely, lovely cards. 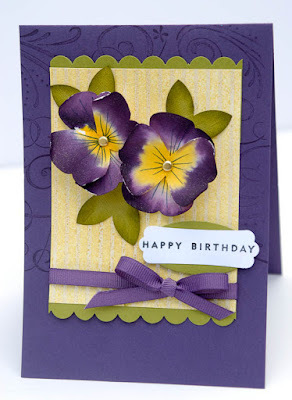 BUT... how did you make those Fantastic Pansies? your team is a credit to you. I haven't got around to trying those butterfly pansy's yet??? Have to let you know Friday 13th is my luckiest day - we still have our little boy & the following Friday 13th we moved house - 2006 was quite a year! !